Independents have a long history running for America’s highest office. But with little success. In 1968, George Wallace, the Democratic governor of Alabama, became the only third-party candidate since 1948 to win any votes in the Electoral College, gathering 45 votes from five Deep South states. In 1992 Ross Perot won the medal for the best popular vote performance of a recent independent candidate—a middling showing of 19%. In 2000, Ralph Nader, with 3% of the popular vote, was widely blamed for costing Al Gore the presidency. Even when Theodore Roosevelt ran for a third, non-consecutive presidential term in 1912 under the Bull Moose Party banner he only won 88 electoral votes. Nationally, third-party candidates have scarcely had more than third-rate successes. There are several reasons for their failure. The chief one is that there is simply no electoral base to support them. According to data from the American National Election Studies, since 1952 the share of Americans not identifying with the major parties has floated between 20% and 42%. However, after removing voters that profess a “lean” toward one party or the other, the portion of true Independents is closer to 1%-10%. Aside from being able to supply votes in small contests—and usually in conjunction with one of the major parties—truly Independent voters are few and far between. The trouble Independent candidates have finding voters is worse than the maths above suggests. Although Mr Schultz claims that the two parties have become so ideologically polarised that there exists a group of fiscally conservative, socially liberal Independents that could prop up his campaign, such a group would be tiny. 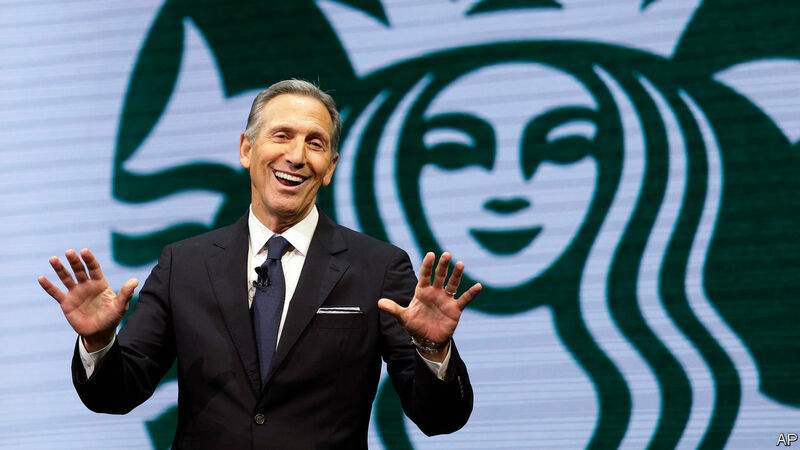 Though educated billionaires like Mr Schultz might believe that LGBTQ Americans have a right to marry and abortion should be legal, while maintaining that high marginal tax rates are bad and cutting Social Security and Medicaid is “fiscally responsible,” the average voter disagrees. According to the political scientist Lee Drutman, just 3% of voters fit into this category. Worse for Mr Schultz, about two-thirds of them cast ballots for either Mr Trump or Hillary Clinton in the 2016 election. This occurred while Gary Johnson, a Libertarian, ran a campaign to attract voters on the right and Green Party candidate Jill Stein targeted voters on the left. Even if there were a larger number of third-party Americans who aligned with the ideology of an underdog candidate, it does not appear that they would be inclined to distance themselves from their partisan attachments. Another barrier to an Independent bid for president is America’s electoral system, which underpins the two major parties’ dominance. The country’s first-past-the-post process of deciding winners encourages voters to cast ballots only for candidates who have a real shot at winning, depressing third-party voting and producing just two parties that compete for a small sliver of truly swing voters. Political scientists call this “Duverger’s law,” and more than two centuries of American political history back it up. In contests in which the candidate with the most votes wins, voters who cast ballots for a third-party underdog are all but wasting their vote. Even when parties fell apart and re-formed as new ones—as in the Whig Party’s giving way to Abe Lincoln’s Republicans—the stragglers eventually fell in line. There is one possible solution to the woes of the two-party system. Ranked-choice voting (RCV) is an alternative election process that allows votes for third-party candidates to be converted to votes for major-party ones in the event voters’ preferred candidate loses. Under RCV, a voter ranks every candidate in order of highest to lowest preference. If one candidate wins a majority of votes, he wins outright, or the last-place candidate has their votes redistributed among their voters’ second choices. The process continues until a candidate wins a majority. In RCV Americans are free to cast their ballots for uncompetitive candidates, because they ultimately avoid the feeling that they wasted their vote. Ranked-choice voting is favoured by political scientists. Supporters say it increases turnout and decreases polarisation. But Maine is the only state that has used RCV for congressional elections, though with evident success. The competitive race for Maine’s second congressional district last year included two viable third-party options, and the elected Democratic representative has so far been more moderate in his voting behaviour than the district’s previous legislator, according to the political scientists at VoteView.com who compute scores of lawmaker ideology. Third-party candidates have a few other challenges. They have to earn their way onto the ballot in all 50 states, typically by gathering many hundreds of thousands of signatures or by winning a set percentage of the previous general election vote in a given state. They also have to get onto the debate stage by amassing significant support in national polling. And then, of course, they have to win the hearts and minds of American voters.